Man U has agreed to pay Juventus a massive £105m fee for France superstar Paul Pogba and will hand him a five-year contract worth £210,000-a-week after tax, according to the Sun UK. After failing with an initial offer of £90m, the Premier League club have finally agreed to match the asking price of Juventus to get their man. The Old Trafford giants' executive vice-chairman Ed Woodward agreed the deal with Juve directors Giuseppe Marotta and Fabio Paratici, as well as the player’s agent Mino Raiola on Wednesday in Manchester. Pogba has already reportedly informed the landlord of the house he rents in Turin that he will be leaving. If the transfer is completed barring any last hiccups, Paul Pogba will become the most expensive player in the world surpassing past record holders Cristiano Ronaldo and Gareth Bale. 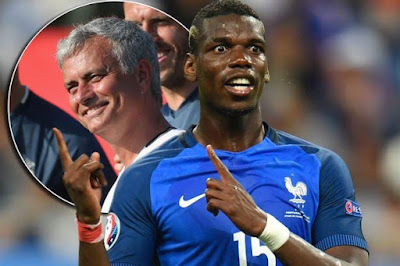 Raiola has convinced his 23 year old client Paul Pogba to rejoin the club he left for next to nothing in 2012 after two seasons because of a lack of first-team opportunities under then-boss Sir Alex Ferguson. Man U manager Jose Mourinho is currently in Shanghai with the rest of the United squad on their tour of China, but has been kept up to speed with all the latest developments in the transfer. It has been left to executive vice-chairman Ed Woodward to put the finishing touches to the deal with super-agent Raiola, who also stands to pocket up to £20m himself.